So, when Nisha pulled out piece after piece of stunning Moroccan Berber jewellery, I couldn’t bear it any longer. If I wasn’t going to be on next flight to Marrakech, I had to get there by another route. Feeling quite like the Ibn Battuta of Richards Town, I set off instantly… up the High Atlas mountains and through the stark Sahara, to finally come face-to-face with chiseled Berber men and gorgeous women bedecked, from head to toe, in silver jewellery…. So ok, Battuta didn’t go out in search of Berbers, but he did leave Morocco and ended up travelling the silk routes for 33 years, on foot and horseback. That was Ibn and it was the 14th century. This is me, with a couple of hours between bus stop pick-ups and music class, racing through the internet on my fingertips and my imagination. We are worlds apart… or are we? 1,500 years ago, he came to India and today, I return to where he started, knowing nothing of his people, for he too was of Berber origin, like almost 50 million people who live in North Africa today. But enough of the Battuta analogy. 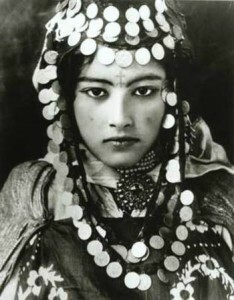 Let me share with you the little I have discovered about the intriguing Berbers. Some say, the name Berber is a variation of the Latin word barbarian, which is what the invading Romans apparently called these hostile tribes. Not surprisingly, Berbers call themselves by a different name – the Amazigh or “the free people”. Their culture dates back more than 4,000 years, which precedes the arrival of the Arabs into North Africa. That’s why the Berbers are considered the true indigenous inhabitants west of the Nile valley. Even now, a large population of Morocco, Algeria, Tunisia and Libya are of Berber descent. So, you have Moroccan Berbers, Tunisian Berbers and Libyan Berbers, who don’t necessarily speak their same language, but share a common culture and heritage, which to this day separates them, ideologically and politically, from their Arab countrymen. Although most Berbers today follow Islam, they continue to moor their daily lives in ancient tribal customs and traditions. A closer look at Berber jewellery provides an insight into some of these enduring tribal beliefs. But that I will reserve for my next blog entry. See you in a couple of days, same time same place! This entry was posted in Morocco and tagged berber, berber jewellery, ibn battuta, kilims, silk road, tadelakt, tiles. Bookmark the permalink. Both comments and trackbacks are currently closed.